So I'm not sure if any of you follow the blog I'm going to mention (he has over 1000 followers so it's certainly possible) but Single Dad Laughing has quickly become one of my favorites. He made this post today. I highly recommend you go and read it. If you don't want to take the time, let me give you a quick rundown. Basically, he compares self worth to a wrinkled up $5 bill. In essence, he says that it doesn't matter how you're feeling about yourself on the outside (some days are more confident than others), your self worth doesn't change. 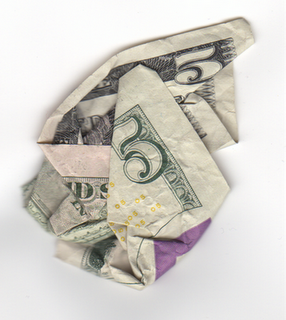 A wrinkled $5 bill is still worth $5...just the same as a new crispy one. I think this is such an important message to anyone that's embarking on a weight loss journey (anyone in life but this is a weight loss blog so work with me). Amy at the Land of Cheese and Sunkist was talking about how now that she's thinner, she feels she's lost some of her "street cred" about being big. We all know that's not true. Amy is the same person she was before she lost the weight. I've read some other blogs (sorry I don't remember which ones) where people are being told they've "changed since losing weight." Chances are you didn't change. My BFF went through this once she lost the bulk of her weight too. She didn't change either. I'm not going to change once I lose my weight. No, I'm not making an empty promise. How can someone promise not to change? Easy. Who we are is who we are. Some of us were just hiding our true personalities, desires, needs, wants, etc. under a layer of fat. Now back to self worth. Do any of you believe that you didn't deserve happiness, love, your dream job, your dream lover, that new house, new car, or whatever you wanted just because you were fat? I'm sure some of you did believe that you did/do deserve less out of life because of your weight issues. Some may settle for a spouse that isn't really right for them because that's who loved you when you were fat. Some may not have had the confidence to seek out a better job or better situation because you felt you wouldn't get it anyway. Was any of this reality? No. You deserve happiness and peace in your life whether you fat, thin, black, white, blind or deaf. For those of us still early in this weight loss journey and are nowhere near goal, we still struggle with this. Losing weight isn't just about the physical adaptation to a new way of eating, moving and living. It's a new way of thinking...not just about food or our relationship with food, but a new way of thinking about who we are, who we want to be and that we deserve to be healthy. We DESERVE to take the time to work out. We DESERVE to feel happy and celebrate our progress. We DESERVE to be the best possible versions of ourselves. I think it's important to have this reminder that we ARE WORTHY of all the things we want out of life and the only thing standing between us and those things are OURSELVES. So...Single Dad Laughing put it a whole lot better than I could so go check out his blog. And remember...wrinkly, wadded up $5 bills are just as good as crisp, clean brand new ones. And pudgy, chubby, overweight panda bears are just as lovable and endangered as brand new cubs. Great post! I fall victim to this so very often, especially in my career. Thanks for bringing perspective and a reminder that we are who we are and we should always shine! What a great post, thanks! I love this post - very thought provoking. I have to say, I agree. And I love SDL's blog. His posts always make me cry, though. Damn him. Amazing post - simply amazing! You made my day and I enjoyed reading every blessed word!! Thank you for making me think, making me smile, helping me to realize that I need to believe in - me! Great post, Manda! I really enjoyed reading this! Thumbs up! Great post, Manda. Shaping Up to a Crappy New Year?